Hi, I am Sarah, a professional foodie and entrepreneur in Barcelona. I’m passionate about food, art, music, and bikes. My Motto: Life is too short to eat and drink bad. What makes you a lovely Lovli Local? I am an Almost Local, I write about food in several websites and for me, food is seriously fun. I always curious and hungry, looking for new places to eat and repeating the fantastic ones. What makes your tours different to others? I eat and write about it. I love sharing precious tips with others and for me, finding an unforgettable meal is a goal. This was a hobby but now is also the best career one could find! What do you like most/least about your city? I choose Barcelona to be my city, so there is nothing I dislike. The sun, the people, the food, the mood. Barcelona is magical, full of hidden places and lovely daily scenes happening. 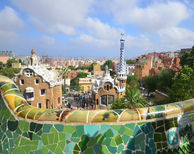 Tour information for Tapas and bars with an almost local in barcelona! TAPAS AND BARS WITH AN ALMOST LOCAL IN BARCELONA!